Do You Understand Your Prescription Labels? We here in NYLPI’s Health Justice Program, along with our partners Make the Road New York, are getting ready to hold a press conference at 12:30pm on Tuesday, December 14 near City Hall at Broadway and Park Place (East side of Broadway). We will use that opportunity to release our new report detailing our findings from a monitoring study of language access in pharmacies, and to join with consumers, advocates, and State Assemblyman Richard Gottfried, State Senator Jose Peralta, and Councilmember Julissa Ferraras in calling for the state legislature to pass a bill that would ensure standardized prescription drug labels and language assistance services in chain pharmacies all across New York State. It may seem like common sense, but prescription drug labels are only effective if patients are able to understand them. That feeling of confusion upon returning home from the pharmacy and not understanding how to take the medication is universal. With dozens of ways for a pharmacist to write “take once a day,” it is often challenging for patients to understand and act correctly on just one prescription instruction. For those who take multiple medications, such as the elderly, and for the over 2.4 million people in the New York who speak English less than “very well” and are therefore considered limited English proficient (LEP), though, the lack of translation and prescription label standardization makes labels literally incomprehensible. The consequences of patients’ misunderstanding prescription labels can be dire and costly. Every year, unintended misuse of prescription medications causes over one million “adverse drug events,” resulting in expensive visits to the emergency room, hospitalization, and even death. Everyone should be given the opportunity to understand their prescription medication labels. Fortunately, solutions exist to this serious health problem that are simple, inexpensive, and efficient for pharmacies to implement. Creating easy-to-understand, standardized prescription labels, and providing that information in a patient’s language in person or over the phone, can significantly improve health outcomes. Since 2007, NYLPI and Make the Road have been championing the issue of safe access to prescription medications in New York State, particularly with regard to language access. We worked with the New York State Office of the Attorney General to enforce existing laws relating to language access in pharmacies, which resulted in settlement agreements with seven chain pharmacies operating across the state. We also worked with the New York City Council to pass the Language Access in Pharmacies Act, which requires chain pharmacies in the city to provide translation and interpretation services for LEP consumers filling prescriptions. This past summer, Make the Road and NYLPI surveyed over 250 chain pharmacies across New York—including Rite Aid, Duane Reade, K Mart, CVS, Pathmark, Target and Walgreens—to determine the extent to which pharmacies were complying with the city law and Attorney General settlement agreements. Chain pharmacies not bound by local law or the settlement agreements were also surveyed to determine whether additional regulation actually improves access to services for patients. The settlement agreements and local law have led to significant improvements in the provision of language assistance services compared to when we began this work in 2007. However, nearly 50% of pharmacies surveyed were still unable to state that they met the prescription label translation requirements of the laws. Further, almost 30% of surveyed pharmacies could not state that they provided mandated interpretation services for medication counseling. Pharmacies not subject to the settlement agreements or local law provide the poorest access to limited English proficient consumers. While the oversight and additional regulation by state and local authorities have had a positive impact on patient access to pharmacies, more needs to be done. The city law only covers New York City chain pharmacies and the settlement agreement expires in 2013. In addition to the ongoing language barriers, the fact remains that many consumers, regardless of the language that they speak, continue to have a difficult time understanding the instructions and labels that accompany their medication, and there is little in existing law to help them. The state bill, championed by Assembly Member Gottfried and State Senator Tom Duane, contains provisions that would ensure that all patients can better understand their prescription medications. The bill, which would apply to all chain pharmacies across New York, would authorize the State Board of Pharmacy to create a framework for standardized prescription labels that are easier for consumers to understand. It would also expand upon the legal requirements already contained in the local law and would codify many of the translation and interpretation requirements of the settlement agreements. We hope you will join us at the press conference, and will sign on to show your support for New York Assembly bill A11627 (Gottfried) and Senate bill 8365 (Duane) and to call on members of the Assembly and Senate to sponsor and support the legislation. According to the US Census of 2000, ten years ago over 35% of the then 8 million residents of New York City were foreign born, and 47.6% spoke a language other than English at home. Since then, these numbers have only grown. Given those demographics, it’s fitting for federal, state and local law to require pharmacies (as well as hospitals, other health care facilities, and all city agencies providing direct public services) to provide language assistance services to limited English proficient (LEP) customers or patients. Language assistance services entail translation (of written documents) and interpretation (of the spoken word). Because New York also requires that pharmacists counsel customers with regard to their prescriptions, both types of service are indispensable. Even so, when activist organization Make the Road New York teamed up with us to file a civil rights complaint with the New York State Office of the Attorney General (OAG) in July of 2007, the results of the ensuing investigation were predictably disappointing. The OAG found seven chain pharmacies with names you’ll recognize – A&P, Costco, CVS, Duane Reade, Rite-Aid, Target, and Wal-Mart – in violation of the law and came away with seven settlement agreements, requiring newly specific and official translation and interpretation services. In all cases, the deadline for implementing the required improvements was at latest May 15, 2010. They had plenty of time. We’re now trying to figure out whether pharmacies have used that time to get in line with their legal obligations. Unfortunately, verifying compliance may not be so simple. On a recent visit to a CVS/Pharmacy and then a Rite-Aid, I asked which languages they could print on their labels and was promptly informed that no pharmacy employees could answer my questions unless I was a customer. The cold shoulder response makes monitoring pharmacies significantly more challenging, and it seems unlikely to be an accidental roadblock. We’ve heard through our contacts in the industry that many of the pharmacies are trying only to comply with the letter of existing laws and not their spirit. And we also know they’re resisting language access requirements in other states. Our allies in California report that pharmacy lobbyists–many from the same companies that signed settlement agreements in New York–are telling regulators on the left coast that it is not possible, difficult or too expensive to provide language assistance services. This is troubling, to say the least, and patently untrue. Recently, for example, we spoke with representatives from a an international firm called RxTran that is well-equipped to create a database of translated warnings and instructions for easy use by pharmacists as an integrated part of their work routine. In fact, RxTran designed such an economically feasible and work convenient product—it typically costs less than $2 per day—that even some small, independent pharmacies have purchased database access. It may be that the chain pharmacies are lazy or greedy and near-sighted (imagine trying to attract customers to whom you are incomprehensible). But for either possibility, we need to remember their pattern of negligence and, now call for the follow up. Failing to provide accurate translation and interpretation has proven devastating on many occasions. Examples range from the children who vomit endlessly until they arrive in an emergency room (only to discover parents have been administering topical medications orally), to the little old ladies who take eleven times the amount of prescribed medicine (due to faulty translation of the word ‘once’). 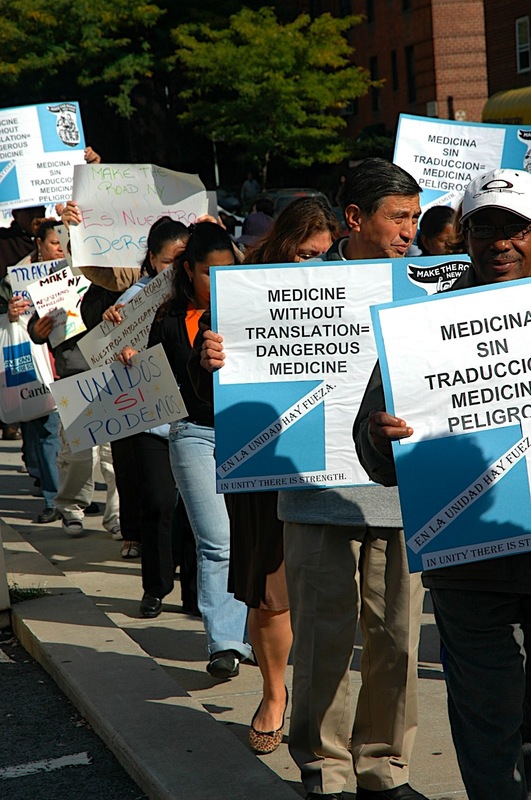 The United States, for better or worse, has not declared English a national language – can the illness and death ultimately associated with simple language errors really be declared an acceptable side effect of pharmacy arrogance? Enforcing language access laws may be as difficult as passing them but we, who deserve to comprehend what makes us well or sick, must hold the Rite Aids, Duane Reades and CVSs accountable for that information, in all the languages we speak.